It happens. What matters is what you do about it. If you're perfect, stop reading. If you're like the rest of us, we have GREAT. NEWS. Having a budget doesn't mean you have to get everything right. And it definitely doesn't mean you'll never overspend. So let that go and read on. The important thing? This is where a traditional budget says you've failed. It's where a YNAB budget says, You're human. Adjust. How to adjust? Move money. You made a plan originally, but now you've got to change it. Look for categories that are green where you can cut back and move some money to your overspent category. That's it. No guilt. Maybe a lesson learned, sure. But no guilt. When you overspend with cash, you spent all the money in that category, plus some money from your other categories, so there is a risk of over-drafting your actual bank account. Because of this, it is important that you hold your budget accountable. 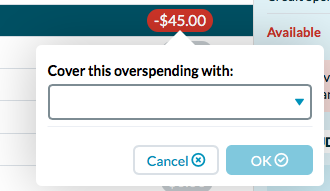 YNAB does this by subtracting any cash overspending from your To be Budgeted in the following month. When you overspend with a credit card, you've racked up some additional debt - though no actual cash has left your budget or accounts. To reflect this, uncovered credit overspending becomes a part of your credit card balance at the end of the month. You'll see the category that you overspent goes to $0.00 in the following month - but you now have more debt to budget for in your credit card payment category. Cash overspending is more urgent in the here-and-now, because you've got less money in hand to adjust and adapt. But beware credit overspending—don't let an orange color, or the fact that you still have cash in hand, leave you piling up debt. Cover your overspending no matter what the color whenever you can!